Peter wrote this letter with an emphasis on the knowledge of God. Knowing in the biblical sense means much more than knowing a name, it includes an intimate relationship, understanding the truth of the individual, a living participation in the life and truth of the individual. Peter speaks about the life of a Christian and then addresses counterfeit followers or as he refers to them scoffers. Peter takes on these false believers by teaching three of God’s promises; God’s Word is true, God’s work is consistent and God’s Will is merciful. Peter addresses the question of the non-believers that God promises to return asking where is He. Peter responds speaking of God’s mercy. Jesus will return but God is patient with us. Giving us all the time we need to repent. God’s time is not that same as our time, in fact God is outside of time, a day to God is like one thousand years to us. So Peter is telling them that God does not delay as we regard delay. 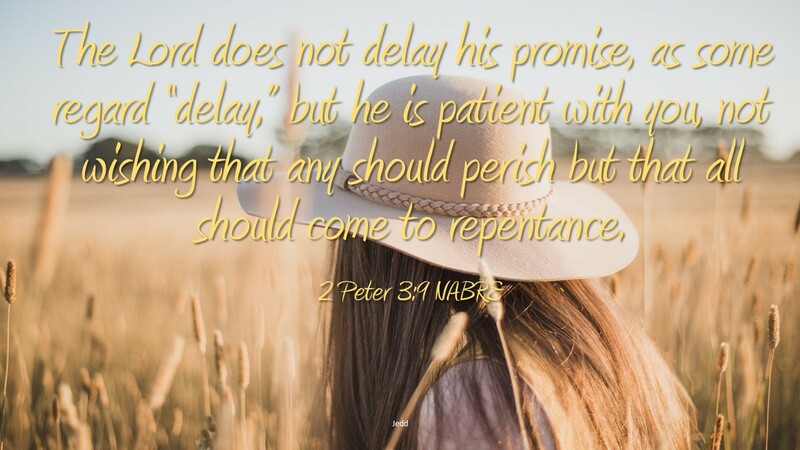 God is patient, hoping no one should have to perish but all will come to repentance. God is not delaying but giving space for all to change their ways. However, in the end God will come again, suddenly and decisively. When God does come the present heavens and earth will pass away. It is important to understand this hope of God, that ALL will repent and will change their ways to come to know God. God knows us and wants us to know Him. This requires time in God’s Word and communicating with God, every day. Knowing God is possible, in fact God encourages it. Do you want to know God? How much time do you spend each day with God?